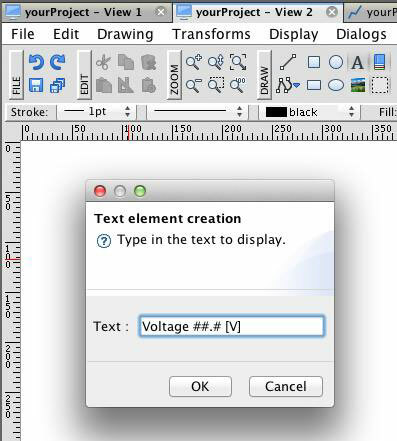 This feature allows you to add text on the drawing canvas. Click on the Text tool icon in the main toolbar and then click on the canvas in the desired location. This will open a new window for the text input. Type in the text to be displayed and click on OK. The text is now placed on the canvas and can be moved, resized, rotated, etc., like any other object. Note: The text in the element can be changed at a later time – select Properties on the right side of the window and look at the Text cell.